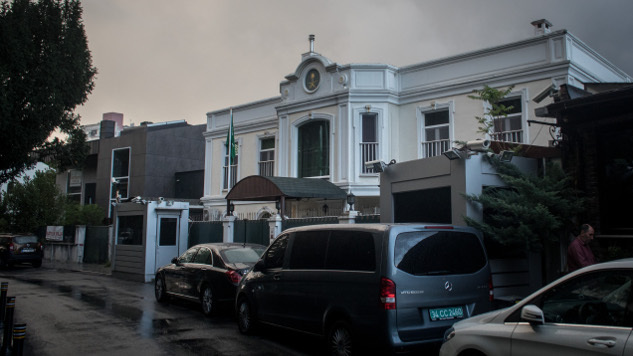 It’s still not entirely clear what happened to Washington Post columnist Jamal Khashoggi, an outspoken critic of Saudi Crown Prince Mohammed Bin Salman’s regime, before his disappearance upon entering the Saudi consulate in Istanbul earlier this month, which has left observers around the world unsure of whether he’s been killed or detained. The Post dedicated most of Thursday’s print issue to their missing columnist, including a headline that reads, “Trump takes soft stance on Saudis,” who, despite being a critical regional partner, may still have been involved in the killing and dismemberment of a journalist at their embassy. The issue also features Khashoggi’s final column, an opinion piece about the need for free press in the Arab world, a brutally prescient final piece if he was indeed killed for his criticisms of the Saudi regime. While President Trump has mostly dismissed claims that Saudis were involved in Khashoggi’s disappearance, going as far as to blame “rogue killers” for his death, the Post’s reporting suggests that the U.S. knew about Saudi plans to seize the outspoken dissident. Yesterday, the Post’s Phillip Bump compiled the paper’s reporting on what the U.S. government knew about Khashoggi’s disappearance, and according to their reports, U.S. intelligence services intercepted communications among Saudi officials in which they discussed luring Khashoggi back to Saudi Arabia, where he would be arrested. Crown Prince Mohammed himself ordered the operation targeting Khashoggi, the reports also say. What happened to Khashoggi afterwards is still unclear, but these reports are still a troubling sign for the effect that his apparent death will have on President Trump’s Middle East policy. The U.S. has always been soft on regional allies like Israel and Saudi Arabia, the top foreign buyer of U.S. arms nearly three times over. But as someone who has based most of his decisions as president on his own deeply flawed personal logic, Trump might let these allies get away with even more terrifying behavior. Trump’s zero-sum, friends-or-foes mentality has clearly affected his handling of Khashoggi’s disappearance. So far, he’s compared this scandal to the one surrounding the allegations of sexual misconduct against Supreme Court Justice Brett Kavanaugh, and has also dismissed the global outroar over Khashoggi’s disappearance by reiterating that he wasn’t an “American citizen”—as if that makes his suspected torture and murder any less disturbing. To slightly reframe what his predecessor once said about him, Trump “is a symptom, not the cause” of the country’s political ills, and his response to the Khashoggi scandal speaks as much to his failure to look outside himself and his own allies as the overall failures of U.S. Middle East policy. And if the reports are true about the U.S. intelligence response to knowledge that Saudi officials were involved in a journalist’s assassination and dismemberment, they will have to face some difficult questions from Americans.